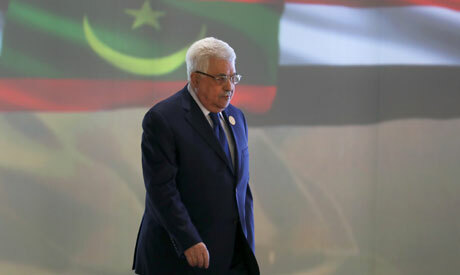 Palestinian President Mahmoud Abbas called on the Arab Summit to adopt the peace plan he proposed at the UN Security Council last February, the Palestinian News & Info Agency (WAFA) reported on Sunday. Abbas said that the plan is based on the 2002 Arab Peace Initiative, and calls for arranging an international peace conference by 2018, giving Palestine full UN membership and developing a mechanism through which future peace talks can be handled. Addressing the Arab summit in Riyadh on Sunday, Abbas accused US President Donald Trump's administration of violating international law by recognising East Jerusalem as the capital of Israel in December. Abbas added that the United States has established itself as a "party to the conflict instead of a mediator that seeks to solve it." The Palestinian leader stressed that Palestinians have never refused to negotiate in the peace process and have worked with all US administrations and the International Quartet on the matter. "We met with Trump several times and waited for a US peace plan, but [the Trump administration’s] latest decision has been rejected by most countries, as it represents a major setback for the peace process," Abbas said. Arab leaders who spoke at the summit today reiterated their rejection of Trump’s Jerusalem decision and stressed their support for the establishment of a Palestinian state with East Jerusalem as its capital. Since 30 March, thousands of Palestinians have demonstrated in Gaza and the occupied territories for the ‘Right of Return’ and against Trump’s Jerusalem decision. Israel has used deadly force against unarmed protesters, killing 34 and injuring hundreds.